A marriage is an expression of two people coming together to share deep emotional bonding centered on service and love. And once married, no matter how many fights or disagreements the husband and wife have between them, there is no question of divorce or separation. They remain married for life. “Are you married?” a visitor in the temple asked me. A brahmacari, or a celibate monk, is sociologically an unusual species – he has no female companion, and apparently no emotional shelter. He seems to be all alone in this world. If he has to survive as a genuine monk and remain celibate throughout his life, he must get married – not to a woman, but to someone else. His companion is Lord Krishna who appears in this world in various forms, like the deity, the holy names and scriptures like Srimad-Bhagavatam. 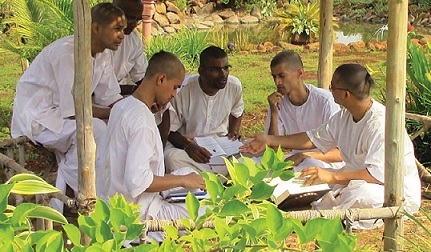 To the extent a brahmacari gets absorbed in studying, hearing and sharing the scriptures, he feels emotional bonding with Krishna . Some chant the holy names prayerfully and find the connection. Others worship and pray to the Deities in the temple with reverential love, and many read scriptures to find their anchor. “After I joined the monastery I would sometimes feel lonely; I’d cry remembering my home and friends; the pulling kept me confused. All that changed when I discovered the Ramayana. As I read slowly this great classic, Bharata’s love, Lord Rama’s determination, Laksmana’s surrender and JaTayu’s heroic sacrifice brought tears to my eyes. My need for an emotional churning of the heart was fulfilled through Lord Rama and Sita’s pastimes. The emotional dynamics reached its culmination when I read Hanuman’s devotion and heroism. Reading scriptures in a mechanical or ritualistic sense would bring little benefit as compared to prayerful, slow and deliberate reading. Pausing as we read to reflect and relish helps the subject matter enter deep into the inner recesses of our hearts. After you read a page, try to recall the contents. It doesn’t matter if you do not remember much, but whatever little you do remember is a great asset, and by trying to recall it, you have not only learnt something, but also added confidence to your abilities. Once you finish recalling, spend some time contemplating what points you liked in the passage you read. This helps us churn our heart with good feelings. Don’t be surprised if you are tempted to read or hear again that you liked. Repeated reading of what you relish brings us closer to emotional fulfilment. To make our lives more meaningful and our reading more purposeful, consider how the contents are relevant to your life. If you keep up the habit of regular reading, you would also see hope and promise emerge each time you face a setback or reversal in your life. That makes your choice muscles stronger, and you could then easily initiate positive changes in life. Seventeenth-century writer Joseph Addison put it succinctly, “Reading is to the mind what exercise is to the body”. American writer Jamica Kincaid confessed, “One of the things reading does, it makes your loneliness manageable if you are essentially a lonely person.” Devotees of Krishna can vouch that if we read about Krishna , then loneliness transforms into a deep emotional bonding with the Lord. And furthermore, if a monk shares with others what he reads, he would blossom as a beautiful, spiritually radiant flower that brings fragrance and joy all around.